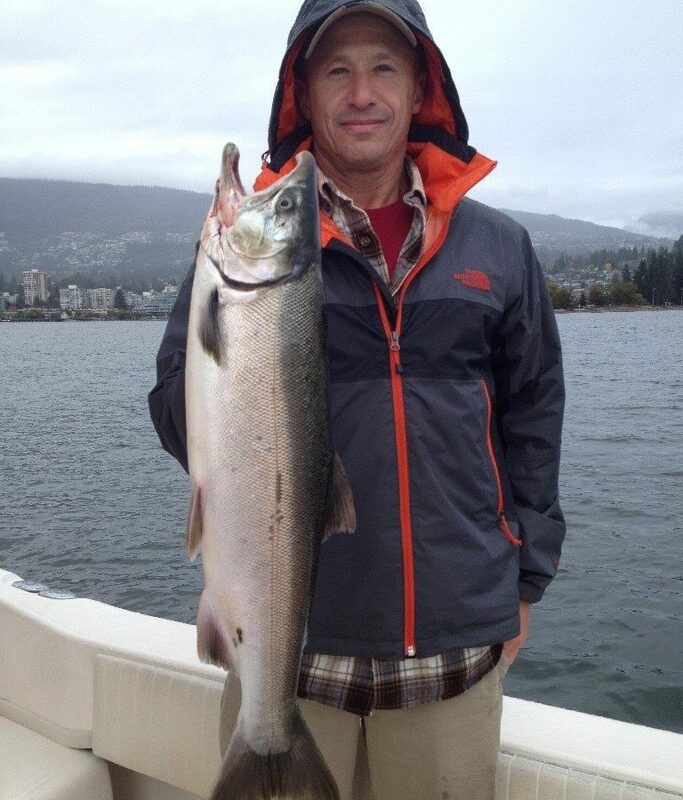 Eddie’s guest Dave with a nice hatchery coho from the Cap Mouth. The fall season is winding down but there are still some fish being caught off the Cap mouth for those of us diehards still out there. Eddie and guests were out yesterday and hooked 2 nice chinook, which unfortunately were taken by seals. The good news is they did manage to release a nice wild coho and keep this good sized hatchery coho. Not bad for a quick mid day charter only minutes from downtown Vancouver! There are decent numbers of chum and coho coming into the Fraser right now so another option is heading down to the South Arm to target these runs. Not many anglers do, so don’t expect big crowds like you would see in August. We are usually focusing our efforts off the Cap as it is so close, but we have had some great days in October for chum and coho up until the end of the third week of this month, so still some time left. The fish are usually in the 30-80 range on the riggers and will take bait, white hootchies and pink hootchies. Off the Cap the usual tactics are working well, glow flashers and teaser heads just off bottom with anchovies or herring. It won’t be long now until we start scouting for winter chinook. We have some boat maintenance planned over the next few weeks, but we will always have a boat or two available for the last of the Cap fish or the first of the winter fish. As one season ends, another begins, and so it goes from the transition of our summer and fall salmon into our winter chinook fishing. I am already looking forward to trolling for some “winters” with a nice cup of hot coffee with calm seas and crisp, cool air.